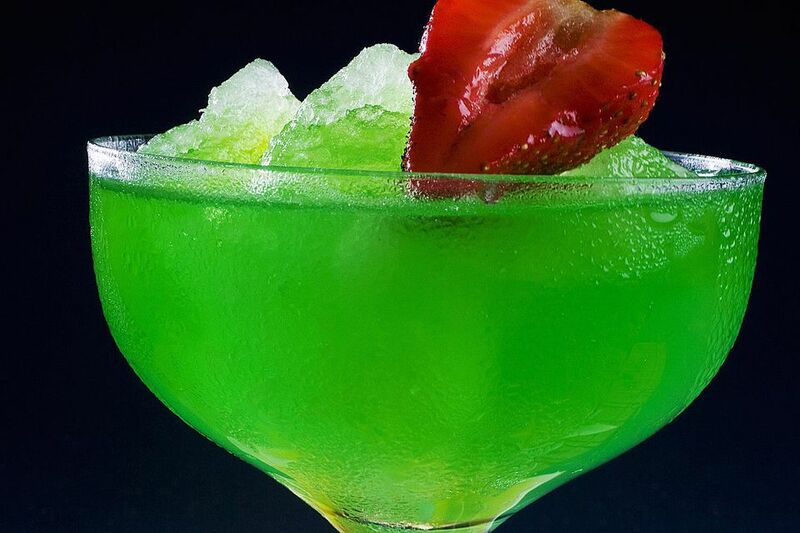 The Midori Berry Bliss is a spirited, flavorful, and fruity punch that is perfect for summer parties. Its bright green color adds a flair to any festivity. Also, the mix of melon, vanilla, raspberry, and pineapple is a taste that will please any palate. This recipe is very easy to mix up and it is written in parts so it can quickly be adjusted to fit the size of party you're hosting. You can even make it for just a few people and serve it in a pitcher or whip up a single drink for yourself on a casual summer afternoon. Fill a punch bowl halfway with ice. Serve in punch cups over ice. You can mix all of the ingredients except the soda ahead of time and store them in the refrigerator. This makes service much easier as all you need to do is place ice in the bowl, add your punch mix, then top it off with soda. To make the conversion of this recipe easier, here are a few examples of how to mix the Midori Berry Bliss to serve as few or as many people as you need. The conversions to the liquid measurements are only approximations and rounded either up or down. A little more or less of any ingredient will not throw off the balance of the punch (that's why this is such a great recipe). While the recipe recommends filling a punch bowl with ice, consider creating an ice ring instead. Not only does this look better in the bowl, but the single mass of ice will melt slower than smaller pieces of ice. This prevents your punch from becoming overly diluted. It's very easy to create an ice ring. All you need is a round mold and an extra day or two to ensure it's thoroughly frozen. Use a bundt cake pan or round gelatin mold with no center. Fill the mold with distilled water. Give it at least 24-48 hours to freeze. Remember that it takes longer to freeze a larger volume of water. Add cut strawberries or whole seasonal berries to the water before freezing to add a nice decoration to the punch. When removing the ring from the mold, you can break it free by dunking it in cool water (not hot) for about a minute. Then, hold the mold upside down over your empty punch bowl and gently tap it until it comes loose. How Strong Is the Midori Berry Bliss? It doesn't matter how much of this punch you are making, the volume doesn't affect the drink's strength. On average, with 35 percent ABV (70 proof) vodkas (typical for flavored vodkas), the Midori Berry Bliss weighs in around 21 percent ABV (42 proof). While it's not the mildest punch, it is also not very strong. If you'd like to tame it down a bit, add more soda (it really won't hurt the flavor).